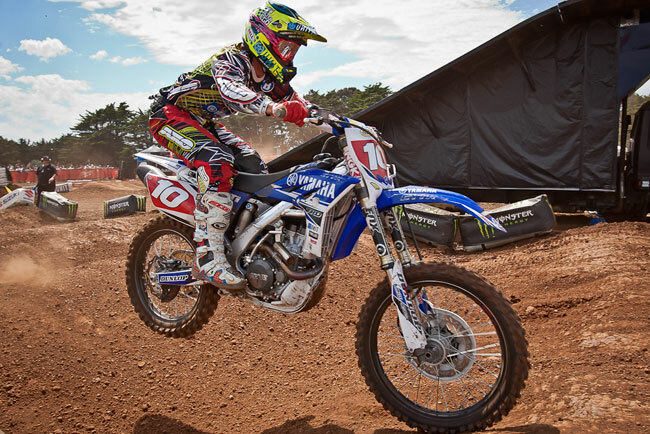 The 2013 Terex Australian Supercross Championship has two new points leaders following a thrilling Phillip Island weekend alongside the Tissot Australian Motorcycle Grand Prix. American Josh Hill (Hart & Huntington/InsureMyRide/DPH Suzuki) won on Sunday to take over the lead in the SX-Open ranks, taking advantage of injured countryman Weston Peick (Carlton Dry Honda), who broke his collarbone in qualifying less than 24 hours after claiming the red plates. The main event today saw Hill streak to his second victory of the season, topping the 20-lap final by 4.480 seconds over Matt Moss (Motul Pirelli Suzuki). Completing the podium was impressive Victorian rookie Sam Martin (DPH Motorsport Suzuki) in third. (Picture above: Josh Hill claimed his second 450 main event to take over the points lead. Image: Grant Reynolds/FiftySix Clix). Fourth today was Motorex KTM’s Daniel McCoy, one ahead of Jake Moss (Campbell Mining Suzuki), who dropped out of a podium position at the halfway point. Earlier, Moss missed qualifying after being struck with illness overnight. Monster Energy Kawasaki’s defending champion Jay Marmont was sixth after closing the opening lap in eighth, while Jacob Wright (Tattoo Racing Honda), Lewis Woods (Hart & Huntington/Snapes Logistics Suzuki), Hayden Mellross (Carlton Dry Honda Racing) and Callum Dickson (Dicksons Port Lincoln Honda) filled positions seven through 10. South Australian Brett Metcalfe (Milwaukee/ADR/SIC Racing Kawasaki) exited the race on lap four. Gavin Faith made it two from two at the Island to lead the 250 series. Image: Grant Reynolds/FiftySix Clix. The championship is now led by Hill on 103 points with one round remaining, five ahead of Matt Moss, and Jake Moss a further two behind. Peick was demoted to fourth after sitting out today. Another American in Gavin Faith (Carlton Dry Honda Racing) claimed the SX-Lites red plates at Phillip Island today, making it back-to-back race victories for the weekend with a 14.526-second buffer. Faith was again supreme aboard the 2014 Honda CRF250R, heading Ryan Marmont (Raceline Pirelli Suzuki) and Victorian privateer Dylan Long (KTM). Marmont worked his way past Long in the dying stages of the race for the runner-up. Jay Wilson remains perfect in the Under 19s title race. Image: Grant Reynolds/FiftySix Clix. Former series leader Luke Styke (Serco Yamaha) was fourth for the second day in a row, sitting in that position throughout the entire 15-lap affair. Another privateer, Taylor Potter (Honda), was fifth. Series leader Jay Wilson (GYTR Yamaha) added a fourth straight win in the Under 19s to stretch his championship advantage, winning by 6.637 seconds from Jake Emanuelli (Raceline Pirelli Suzuki) and Joel Wightman (Yamaha). The Women’s championship went to Meghan Rutledge (Kawasaki) in a clinical performance, winning all three races today at Phillip Island to claim the third round win over Sayaka Kaneshiro (Honda) and Jessica Patterson. In the series it was Rutledge who won the number one plate in its inaugural running, from international duo Patterson and Kaneshiro. 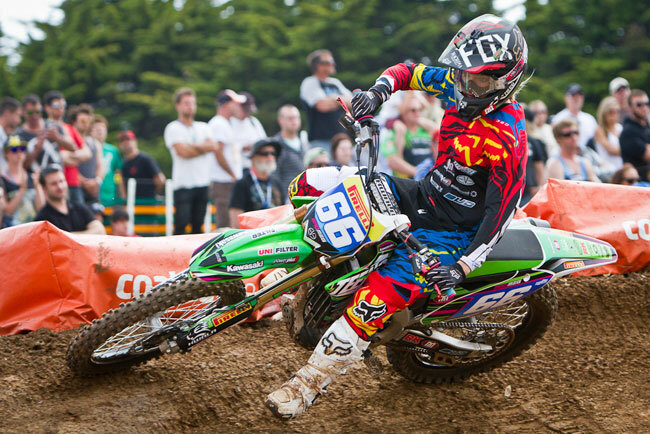 Meg Rutledge won the first ever Australian Women’s Supercross Championship. Image: Grant Reynolds/FiftySix Clix. 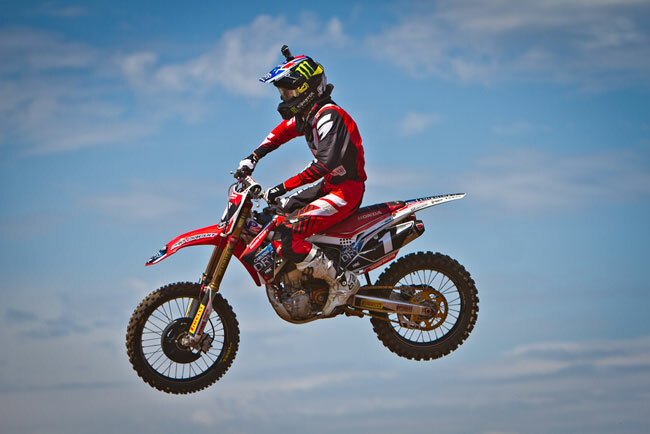 Australian Supercross will resume with the sixth and final round at Toowoomba in Queensland on Saturday, 16 November.